Following up from last week’s post, I had a few comments regarding a list of Ani-TAY’s favourite anime. So I have taken it upon myself to poll the community and contributors - and here is that poll! After 2 weeks of voting, a group of Ani-TAY contributors including myself will calculate the results, based on total point value, and publish the finished list. 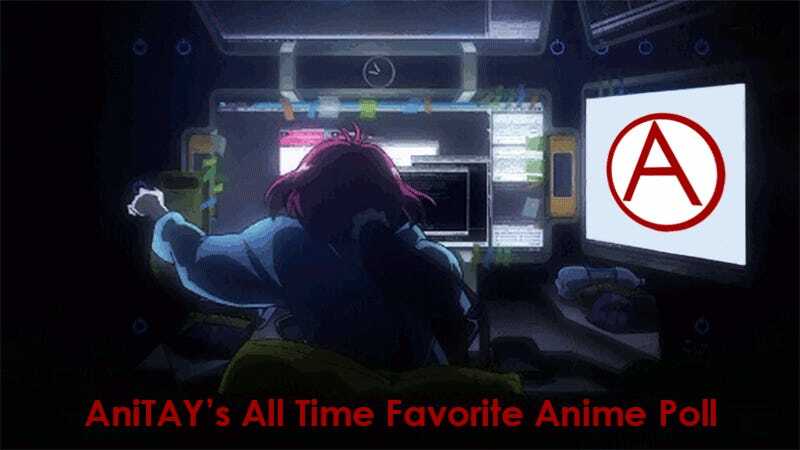 An anime voted as #1 on your list will earn 10 points, decreasing as the list goes on, down to a single point for a #10 pick. (Note that leaving blank spaces will not increase point values for the rest of your list.) An anime requires a minimum of 11 points to be considered; this guarantees a minimum of two votes. All split-cour shows and direct sequels will be rolled into a single series; you may only vote for any given series once. However, reboots and spinoffs are their own thing. As an example, Sword Art Online season 1 and season 2 are both considered the same series; Fullmetal Alchemist and Fullmetal Alchemist: Brotherhood are different series, the latter being a full reboot. Similarly, all cours of Fate/Kaleid Liner Prisma Ilya are rolled into one, separate from Fate/Stay Night which is also separate from Fate/Stay Night: Unlimited Blade Works. If there is a series you’re confused about, please ask in this thread and we’ll be happy to clarify. All such series compression will be noted in the results. Ties will be broken by a three-step process. First, by average position; if still tied, by number of instances; and finally, if still identical, by a completely subjective vote by the tally keepers. This will also be made clear in the results, if it comes to that. Remember that even though the calculations are objective, everyone voting is subjective and may have different tastes, so try and keep the rage down. This is just for fun, after all, and there’s always next year. Happy voting! Edit: As someone has asked, yes you may put movies in your top list and series of movies like Kara no Kyoukai and Mardock Scramble will count as a single entry, and movie continuations of a series will be counted in a vote for a series (such as Gintama or the disappearance of Haruhi Suzumiya).